Many years ago a pastor at our church speaking to a group of men on the topic of work and faith used me as an object lesson to show how Christians should perceive their work. He picked me out of the crowd and said “Mike, you sell IBM computer systems for the glory of God, right?” He was serious. I was dumbfounded. I stared back blankly, not really knowing what he was talking about. In fact, I never thought of God when I was selling computers and was quite certain that God didn’t care about my computer selling. It was the classic disconnect that many Christians have when it comes to their work/vocation and their Christian faith. What did one have to do with the other? Isn’t it just a job? How am I to be a “good Christian” in this secular job? Am I even in the right vocation? A Job, a Calling or Ministry? But how does this really play into our daily work life or how we even choose our profession? Jesus lived most of his life functioning as a carpenter. Why? Because his earthly father, Joseph, was a carpenter in the area around southern Galilee. He didn’t preach and have a public ministry until the last 3 years of his life. He studied the scriptures and followed God’s precepts and instructions as all Jewish boys and men were taught in his day. He made a living and worked his trade well with competence and skill. As with us today, it isn’t what one does as a profession that is important; it’s who one is in their work and daily life. As noted previously (see 8/3/13 post, A Singular Calling), we may be factory workers, doctors or business people of all classes. What matters is our devotion to the calling of God to love Him and our fellow man and surrender our life, gifts and talents for His purposes. Certainly easier said than done. It wasn’t until my mid-40’s that I awoke to a deeper understanding of full surrender in the area of one’s vocation. After a 20-year career in technology sales and management, I faced a crisis of vocational direction. With the market downturn reaching bottom after the tragedy of 9/11, I felt a holy nudge to start my own business. The world, my cautious wife, and risky circumstances (the first of 3 children starting to enter college years), warned me of the challenges in such a dark economic time. But a compelling inclination (not a voice or whisper, but a compelling inclination) moved me to take a step in faith and trust. Near the end of my first quarter of operations, my business venture was teetering. One clear morning driving home from a meeting I prayed specifically for God to give me “a sign” – a bold move I thought at the time might lead to a slap down. Was I doing the right thing in starting this business? Maybe I “heard” it wrong and I was supposed to just go “get a real job.” My plea was sincere and specific. I told God that I would last it out until the end of the quarter – just another 30 days. I told my wife of my request of God for “a sign” within the next month and went into my office. Within 15 minutes I received a call from an organization that inquired into my services based on a strong referral that morning. Their major requirement however was that they “had to have the project done within the next 30 days.” Twenty minutes later I received another call from a company that wanted a project done, however it “had to be done within the next 30 days.” I wept at my desk. I do believe I got my sign. That was 12 years ago. Lots has happened since then – 3 college graduations, 3 weddings, 4 grandchildren. I still run the same business that has now become a platform, not for religious proselytizing, but for the glory of God, reflecting simply good work and services in the marketplace done with gifts and talents offered up for His purposes and direction. You see, that pastor 30 years ago was correct. I in my naivety, and God in his infinite patience and mercy, allowed decades for me to grow in maturity and surrendering faith toward a closer walk with Him under His authority, not mine. It’s a better way to live, regardless of your profession. 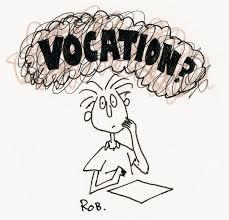 Have you surrendered your vocation, hope and dreams to the glory of God? Mike, very timely reading for me as I find myself in a similar situation. Late 40’s, been out of the workforce for while to spend more time with my family. Now I am exploring returning to my career and trying to discern God’s plan for me and working on the courage (and my wife’s courage) to yield to His plan.